Using under-sea fossil evidence and its marine DNA, researchers were able to trace how climate change led to the decline of Harappan Civilisation. Bengaluru: Climate change was primarily responsible for the decline of the ancient Indus Valley Civilisation (IVC) — also called the Harappan Civilisation, a new study has found. Using under-sea fossil evidence and its marine DNA, researchers of the study were able to conclude that climate change in the form of an increase in winter monsoon could have led to migration of people, thus causing the decline of IVC. Four thousand years ago, IVC or the Harappan Civilisation, thrived in the Indian subcontinent. The settlement existed around the Indus river on fertile lands and was the biggest of the three ancient “cradles of civilisations”, along with the ancient Egyptian and Mesopotamian settlements. Its population was spread across regions that today span Gujarat, Rajasthan, Punjab, Kashmir, Uttar Pradesh, and the Pakistani provinces of Sindh, Punjab, and Balochistan. It existed in the Bronze Age between 3300 BCE and 1300 BCE. IVC was surprisingly sophisticated. Archaeological remains of the cities of Harappa, Mohenjo Daro, and Rakhigarhi show well-planned cities that displayed evidence of urban centres, municipal governments, flourishing trade and art, and architecturally well-constructed houses. IVC is the oldest civilisation to have a sewage and water system, with covered drains running through the city and houses equipped with flush toilets. 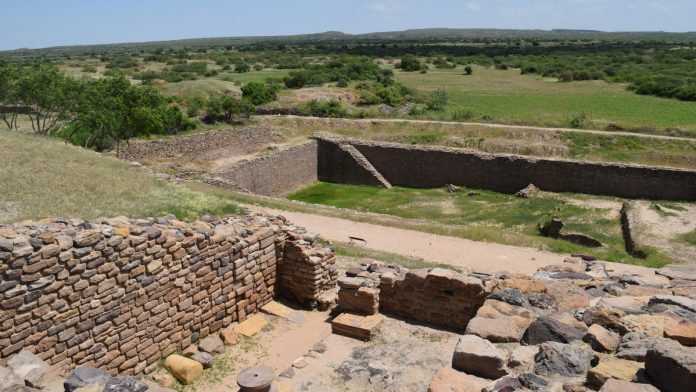 Hydraulic engineering was very advanced and remains show evidence of water management systems, public and private baths, and underground drains. The society was primarily agricultural, with advanced usage of tools and metallurgy, sculpting, trade with far away Egyptian and Mesopotamian civilisations, early progress in science and mathematics, a practical writing system that still hasn’t been decoded, possible early forms of religion, as well as evidence of early stages of dentistry, including teeth drilling. However, evidence also indicates that after about 1900 BCE, human population dwindled in the area, with large numbers of people moving eastward, towards smaller villages in the foothills of the Himalayas. By 1800 BCE, all the cities in IVC were fully abandoned. Around 2500 BCE, the climate in the region slowly began to shift. First the winds and the rains changed, causing summer rain to slowly dwindle. This was a big problem for agriculture in the region, eventually making it near impossible. “Although fickle summer monsoons made agriculture difficult along the Indus, up in the foothills, moisture and rain would come more regularly,” says Liviu Giosan, geologist and lead author of the paper that was published in the journal Climate of the Past by Woods Hole Oceanographic Institution (WHOI). “As winter storms from the Mediterranean hit the Himalayas, they created rain on the Pakistan side, and fed little streams there. Compared to the floods from monsoons that the Harappans were used to seeing in the Indus, it would have been relatively little water, but at least it would have been reliable,” Giosan adds. This pattern of weather change and monsoon drying up was not easy to find; the evidence wasn’t in the soil. To understand this better, the researchers studied the ocean floor. They collected core samples from bottom of the Arabian Sea, at several locations off the coast of Pakistan. They then looked for fossils of creatures that were sensitive to rainfall: Foraminifera, shells of single celled planktons. By studying these forams, they were able to understand which ones were sensitive to summer and which to winter, thus identifying seasons they thrived in. And then came the DNA evidence. “The seafloor near the mouth of the Indus is a very low-oxygen environment, so whatever grows and dies in the water is very well preserved in the sediment,” says Giosan. “You can basically get fragments of DNA of nearly anything that’s lived there,” he says. During winters, strong winds stir up the ocean, bringing in more nutrients and sediments from the ocean towards the coast. This promptly kickstarts a flurry of reproductive activity among marine creatures, which drastically increase in number. The rest of the year, the sediment deposition is less and not as rich, leading to less biodiversity. As much DNA as possible was sampled in these sections of core samples. “The value of this approach is that it gives you a picture of the past biodiversity that you’d miss by relying on skeletal remains or a fossil record. And because we can sequence billions of DNA molecules in parallel, it gives a very high-resolution picture of how the ecosystem changed over time,” says William Orsi, paleontologist and geobiologist at Ludwig Maximilian University of Munich and co-author of the paper. This was the time period when a mini ice age was just beginning. The cold air from the Arctic blew down to Europe and the Atlantic, which in turn pushed winds and rain down to the Mediterranean and tropical regions, modifying long-term climate and changing the course of rivers. Using the combination of the fossil evidence and its marine DNA, the researchers were able to conclude that monsoons consistently increased during winters and decreased during summers, eventually completely drying up in the summer. With these results, they were also able to trace the diminishing population and the movement of people from cities to villages. These results are a warning for what is happening today, says Giosan. “If you look at Syria and Africa, the migration out of those areas has some roots in climate change. This is just the beginning — sea level rise due to climate change can lead to huge migrations from low lying regions such as Bangladesh, or from hurricane-prone regions in the southern US back then,” says Giosan. “The Harappans could cope with change by moving, but today, you’ll run into all sorts of borders. Political and social convulsions can then follow,” he adds. Recent studies, including DNA, have denied the possibility of attacks by Aryan. Although the claim of Rig Veda about the physical features of Aryans that they were tall and white-skinned, having light-coloured hair etc. clearifies that they migrated from Central Asian region (where they would have come from Steppe). This is anologous to the comparative study of Rig Veda and Zend Avesta. Therefore, they must have migrated from the regions north-west to India, yet at this point of time, the new researches have successfully proved in denial the Aryan massacre of Harappans. Its not climate changes, its ARYAN RACE WHO CAME ON TGE PRETEXT OF BISNESS FROM MESOPOTAMIA STARTED TO KILL ALL THE WISE AND PRUDENT PEOPLE , ALL THOSE WHO QUESTIONED THEIR AUTHORITY, IDOLATRY, CAST SYSTEM AND SUPERSTITIONS AND THEY STARTED TO DEGRADE AND BELITTLE INDUS PEOPLE AS BORN OUT OF BRAHMINS FEET, EVEN TODAY THEY DO IN OFFICES, LOCALITIES, POLITICS AND IN ALL SPHERES, ARYAN RACE USED TO KIDNAP SINGULARLY AND KILL THUS TGEY ERASED ALL BOLD AND WISE INDUS VALLEY CIVILISATION PEOPLE, THE REMAIMING PEOPLE KNOWING THE CRUELTY OF THESE ARYAN RACE FLED AND REACHED TO SOUTHERN INDIA. ALL VEDAS, MANUSMRITHY, PURANAS HAS NOTHING TO DO WITH INDUS PEOPLE. INDUS PEOPLE WERE LIVING AS ONE PEOPKE, UNDER ONE PRIESTLY KING AND USED TO WORSHIP ONE GOD. THESE BRAHMIB# DESTROYED MY SWEET VIRGIN IBDUS VALLEY CIVILISATION AND ESTABLISHED THEIR VEDIC WICKED AND EVIL CULTURE. ALL THEIR FESTIVALS ARE DESTRYING ENVIRONEMENT, DEEPAVALI, DUSSERA. INDUS VALLEY CULTURE WAS THE BEST. LET US RETURN TO OUR INDUS CULTURE, REJECT THESE HINDU ARYAN CULTURE. First you have to leave your religion i.e. Christianity in order to embrace the Indus valley culture because indus valley people were not christians. Btw you must be some keralite. Anyways. Leave christianity first and ask all your christian brothers and sisters to leave christianity too and embrace the indus valley civilization. The change starts with you.